Editor's Note: William Dalrymple is a Scottish historian and prolific writer, art historian and curator, as well as a prominent broadcaster and critic. Dalrymple's interests include the history and art of India, Pakistan, Afghanistan, the Middle East, the Muslim world, Hinduism, Buddhism, the Jains and early Eastern Christianity. He is also one of the co-founders and co-directors of the annual Jaipur Literature Festival. Dalrymple has lived in India on and off since 1989 and spends most of the year at his Mehrauli farmhouse in the outskirts of Delhi. Sutra Journal is honored to publish his five part series on the History of Indian Art - This is the fourth of the five articles. Two hundred and fifty years ago, the Punjabi hilltown of Guler was Florence of the Himalayan foothills. Behind its walls, amid a region wracked by warfare and bitterly divided between a patchwork of rival principalities, its rulers were discerning patrons of the arts: poetry, dance and music all flourished in this remote valley on the edge of the Himalayas. But Guler was particularly famed for its painters. Then as now the town occupies a spectacular site, above a bend in the river Ravi. It is surrounded by wooded hills, the view on one side framed by the snow peaks of the Dhauladhar range and on the other by a large lake, kingfisher-blue in the morning, turning silver by late afternoon. Today, nothing but a small village—all leathery water buffaloes and herds of brindling goats—squats behind the once magnificent walls. But although now half-returned to the jungle, with roots and vines spiralling over its bricks, much of the fabric of the 18th century town still exists: the farmer’s milking yards reveal themselves on closer inspection to be crumbling mansions. The elegant colonnades and 18th century courtyards, once home to Punjabi princes, are now occupied by peasant women in Pahari headscarves threshing grain. Overlooking everything, rise the battlements of Guler fort. The leading painter in Guler at the turn of the 18th century, when the town was at its peak, was a brilliantly innovative miniature artist named Pandit Seu. He was active at the time when the puritanical Mughal Emperor Aurangzeb had begun disbanding the Mughal atelier in Delhi. As a result, some of the finest painters in the capital were migrating elsewhere with their sketch books, albums, boxes of pens, brushes and stone-based pigments, all looking for patronage in the regional courts that had sprung up to fill the void left by the shrinking empire. 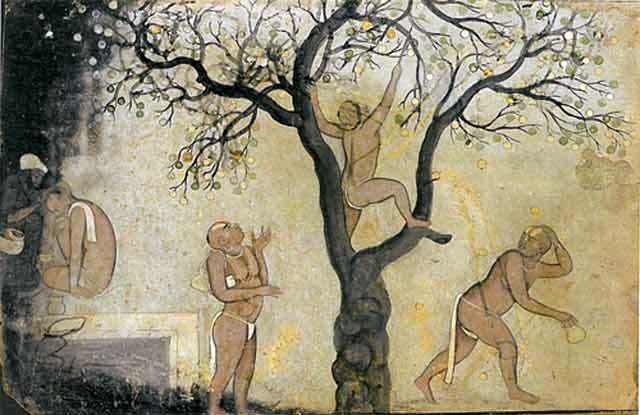 Many of the greatest Mughal painters seem to have come from Kashmir and the Punjab hills, and as work ran out in Delhi, they returned home to courts like Guler in search of employment. Pandit Seu and his talented sons Manaku and Nainsukh—the name means ‘Delight of the Eye’—all painted in a style which showed familiarity with the latest work being painted in Mughal Delhi. But the subject matter that interested the rajas of Guler, and particularly a discerning Guler hill Rani named the Lady Malini, was different from the court scenes and dynastic histories beloved of the Mughals. For the rulers of Guler were devoted Vaishnavite Hindus and commissioned cycles of illustrations to their favourite religious texts: vibrant images of the Ramayana with its exiles, struggles, battles and redemption—and an even more elaborate cycle of meditations on the Gita Govinda, the love poem at the heart of the cult of Krishna, with its tales of the unquenchable love of the beautiful Radha for the irresistible cowherd- god, and their secret assignations in the depths of the night-forest. A Lady and a Painter (Lovers United by a Painting). Pahari, ca. 1790-1800. So it was with Nainsukh. The most evocative site in Guler today lies on the north face of the city walls. Here a magnificent ceremonial road of carefully-cut flagstones leads out of a gate decorated with monumental statues of Lord Hanuman, and corkscrews down towards the banks of the river Ravi. It was down these steps, one morning in 1740, that a thin young man just short of thirty, with a slightly hesitant expression, buck-teeth, and a light moustache could be seen heading along the steep cobbled road leading from the Kashmir Gate, and making for the ghats of the fast-running river Ravi far below. Just as Raphael moved from Urbino to Rome to make his name, so Nainsukh moved from Guler, where so many painters were already at work, to find a more needy and generous patron. 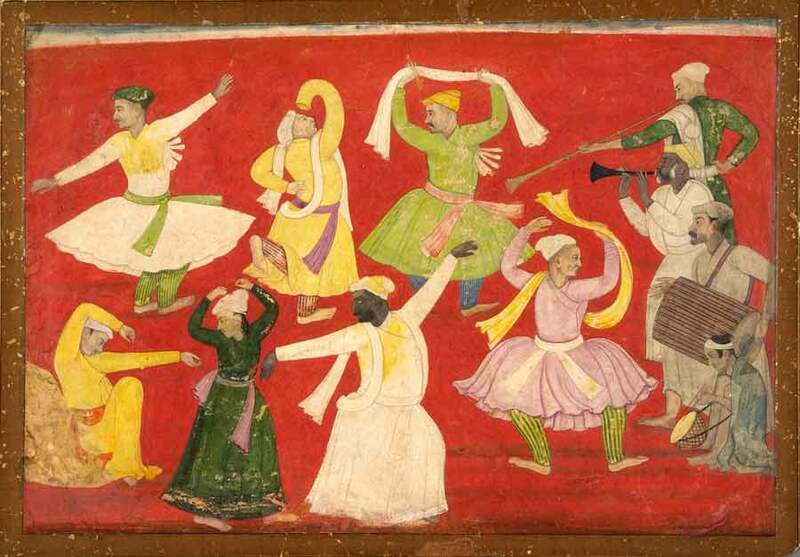 It was in the neighbouring Himalayan princedom of Jasrota that Nainsukh began producing the work that led to his being regarded today as one of the greatest 18th century Indian painters. In Jasrota, Nainsukh brought together all the precision and technically exquisite detail of the Mughal tradition, the bright colours of Rajasthani painting, the bold beauty of early Pahari art. And to all this, he added a humour and a humanism, a refinement, and above all a precise, sharply observational eye that was entirely his own. It was here that he painted probably his most famous work, A Leisurely Ride. Nainsukh broke free from the formality of so much Indian court art to explore the quirks of human reality, stripping down courtly conventions to create miniatures full of living and breathing individuals. His characters are often portrayed somewhere on the outer boundary between portraiture and caricature, yet they are always sympathetically observed. Even in his large crowd scenes, there are no ‘stock’ figures: everyone—each page, each village beauty, each gardener—is shown in portrait form as a real person, complete with all their oddities. Nainsukh’s art is for many of his admirers a summation and climax of the Indian miniature tradition. But it was not just that Nainsukh was a brilliant artist. His work gives a unique insight into the relationship between an Indian artist and his patron, between a court and a court painter. Raja Balwant Singh and Nainsukh seem to have had an unusually close relationship and must have been of roughly similar ages. 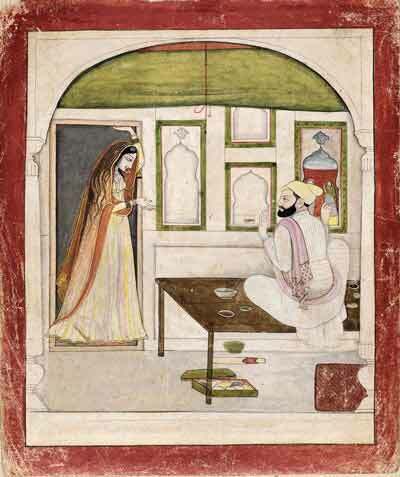 The chronology of Nainsukh’s miniatures lead us from the family sketches and self- portraits of the artist’s own adolescence, through the move to Jasrota, his first commissions for Balwant’s father, Mian Zorawar Singh, and on to his first images of Balwant, his future patron: a good-looking dandy of a young prince in all his silken finery, sitting back on a bolster in a gorgeously striped robe as he puffs away at his water pipe, his falcon glaring from his wrist; or else as a handsome youth standing regally on a terrace, a sword in one hand, a sweet-smelling narcissus in the other. Then Balwant succeeds to the throne and we follow the young men of the court on hawking and lion and tiger hunting trips; and to music evenings and dance performances. One newly discovered image shows a Raja Balwant Singh standing on a terrace of a monsoon evening as white egrets fly against the lightning-flecked storm clouds massing around them. 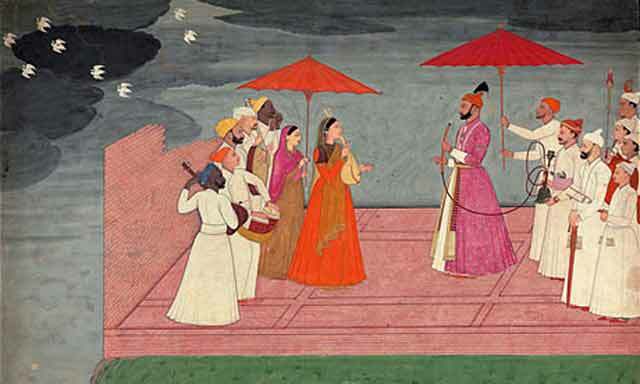 A party of musicians play music for the Raja as he looks out over the walls of his palace, while behind him his male attendants wait on his pleasure: one holds his hookah, while another shelters him with a red umbrella. There are images of quiet evenings where the Rajas, wrapped in a shawl, sits in front of a blazing fire with a glass of some warming mulled wine. We see the painter standing, bowed in reverence, behind his enthroned patron, as the connoisseur-prince carefully examines a new devotional painting and his attendants look on to gauge his reaction. We even see such everyday yet oddly intimate scenes as Balwant’s Singh’s visit to the palace barber to have his beard trimmed. Then, slowly, the story darkens. A group of villagers assemble, led by an aggressive looking Brahmin. There is some sort of palace coup; the Raja is seen standing alone on his battlements, isolated from all. Years of exile follow. Balwant Singh travels the hill country, taking shelter in villages, as his court artist, apparently his last confidant, shares his exile. Nainsukh paints him at night, warming his hands on a rustic bonfire among a group of villagers, or writing letters in his tent, careworn and half-naked in the summer heat of his day, with only one attendant left to him. Finally, Nainsukh shows himself escorting his patron’s pot of ashes for immersion in the Ganges at Hardwar. It is a unique sequence that has no parallel in Indian art. 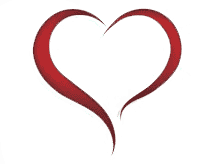 Yet for all his singularity, Nainsukh did not produce his work in a vacuum. The Punjab hill states of the Himalayan foothills in the late 18th century were going through a period of astonishing creativity, as a series of small remote mountain fortresses suddenly blossomed with remarkable artists, each family of painters competing with and inspiring each other in a manner comparable to the rival city states of Renaissance Italy. However, while the greatest artists of Italy had their lives recorded by Vasari, and the biographies of even the most minor ones have been long been the subject of research by art historians, the Indian scenario is still much more obscure and Nainsukh is the only Indian miniature painter to be the subject of a full-length study. The reconstruction of his life, and those of other Indian masters, has taken place only recently. 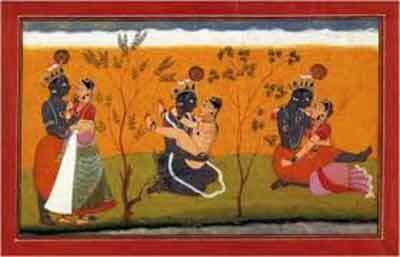 Over the last 40 years, a small group of scholars of Indian art have been closely analysing signatures and inscriptions on miniatures to recover the names and in some cases tantalising fragments of biography for dozens of painters: the human story behind the stylistic history of Indian painting. The man who has done more than anyone to bring the Indian masters back from anonymity is India’s pre-eminent art historian, Professor BN Goswamy. Employing a combination of remarkable detective work, intuition and connoisseurship, Goswamy managed to marry together the evidence from inscriptions on miniatures with innovative new sources. Inspired by the picture of Nainsukh escorting the ashes of Raja Balwant Singh to Hardwar, he looked through the 18th century pilgrim records kept at the pilgrimage town. There he found vital details of genealogy which allowed him to reconstruct the entire family network of Pandit Seu, Nainsukh and Manaku, and their many miniaturist grandchildren and cousins. He showed how the family shared a common artistic style, but their mobility between different centres of patronage effectively made nonsense of the existing system of categorising miniatures by centres of production. What was important, Goswamy showed, was not where a particular miniature painting was produced, or even who the patron was, but instead which artist, or family of artists, was holding the brush. Court styles could vary hugely, depending on who was at work, but different families shared common training and techniques and stylistic idiosyncrasies. Thanks to Goswamy’s pioneering work, most of Nainsukh’s greatest paintings now reside in the great museums of London, Zurich, New York and Delhi. His greatest masterpiece, and certainly my personal favourite, A Leisurely Ride, can be found in London’s Victoria & Albert Museum. It shows a courtly company riding out on a winter’s evening. In this painting, you can almost hear the male singer Saddu with his lute, can admire the vulnerability and beauty of the lovely dancing girl Amal as she rides swathed in her winter shawl, turning back to catch the eye of Mian Mukund Dev, another of Nainsukh’s patrons; and you can sense the growing intimacy between the two of them. This is Indian courtly life at its most elegant and perfect: music, the faint bubble of water pipe, the chill of a winter sunset, a mist of yellow winter mustard, hunting dogs out on the hills looking for partridges, and in the centre of it all, a blossoming love affair, with its consummation soon to come.